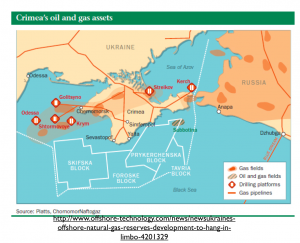 The fate of Ukraine’s off-shore gas deposits remains to be seen. So does the eventual position of the de facto maritime border between Russian-dominated Crimea and Ukraine proper, a potentially vexatious issue. 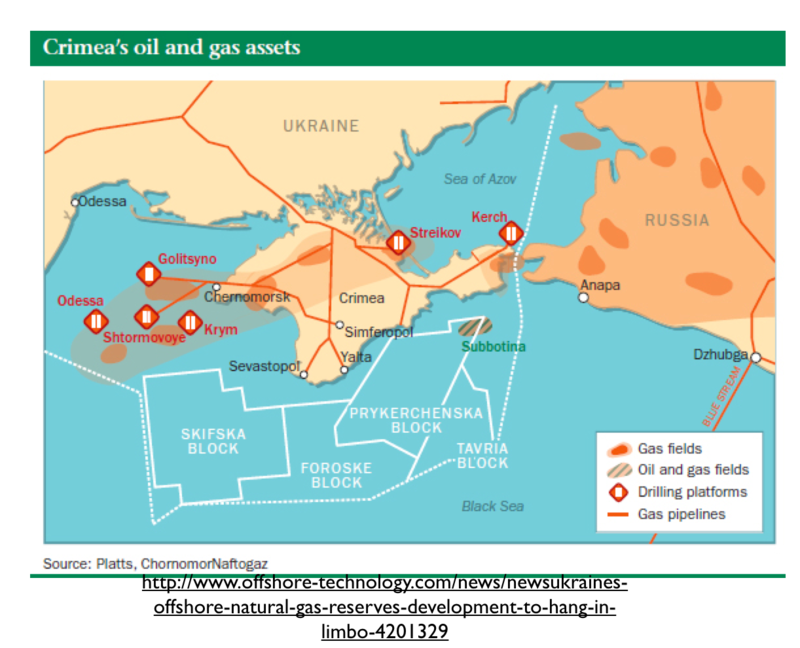 Ukraine’s unconventional onshore gas deposits, however, may prove more important in the long run. The issue here is shale gas, trapped deposits that can only be released by hydraulic fracturing (fracking), a technique honed over past decade in the United States. 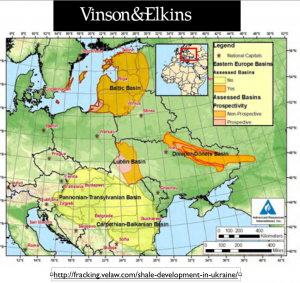 According to 2011 data from the US Energy Information Administration, Ukraine’s “estimated recoverable shale gas resources” amount to 42 trillion cubic feet. This figure is the 18th highest in the world, although it is dwarfed by the 1,275 trillion cubic feet of China and the 862 trillion cubic feet of the United States. 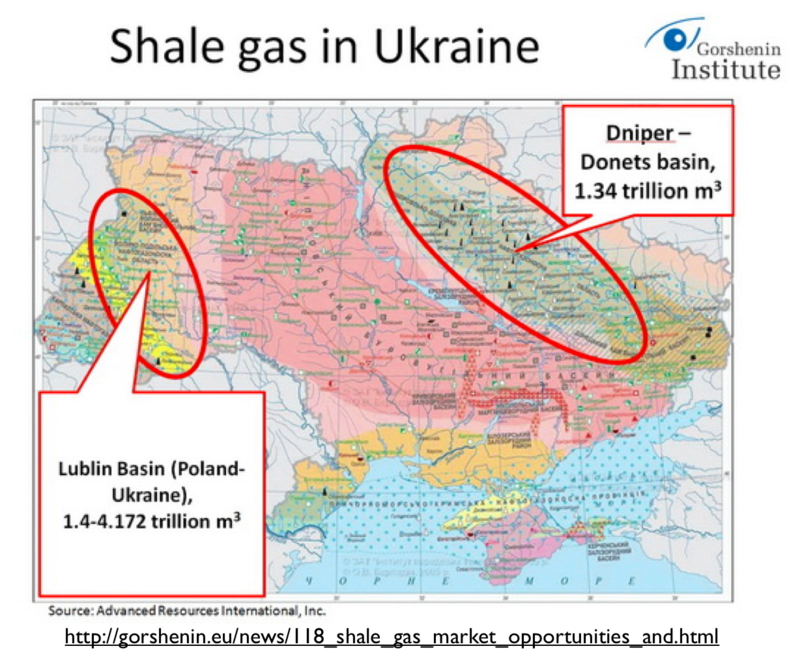 According to a 2012 Reuters article, Ukraine had hoped to start commercially production of shale gas by 2017. 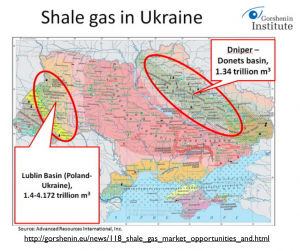 But again, Ukraine’s shale gas deposits are not necessarily geopolitically secure. 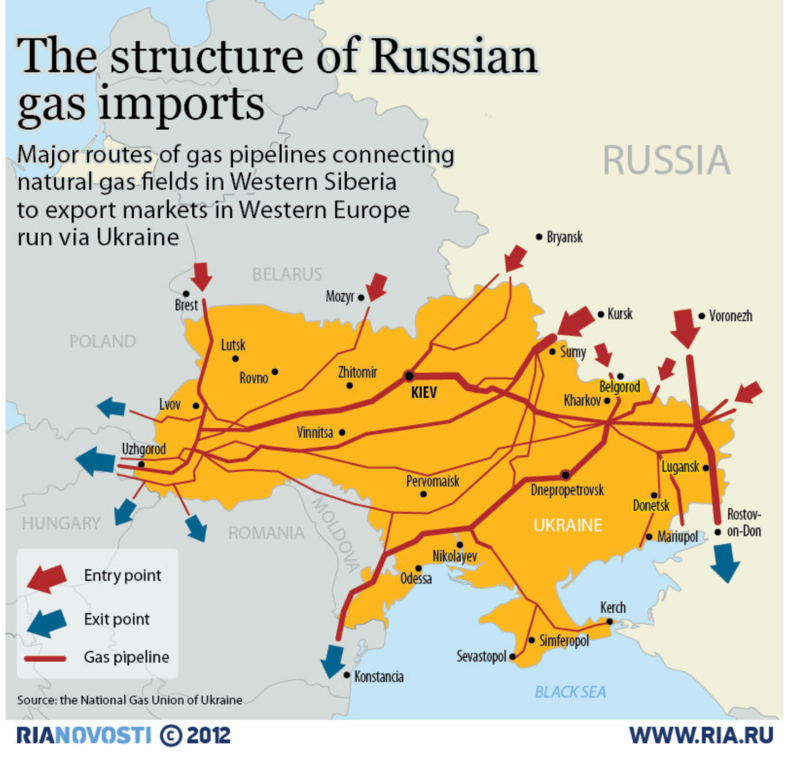 Robert Kaplan, in his Time essay analyzed in Monday’s post, emphasizes this point, claiming that Putin has sought to “demonstrate Russia’s geographical supremacy over the half of Ukraine … blessed with large shale-gas reserves” (p. 33). In actuality, the situation is more complicated. 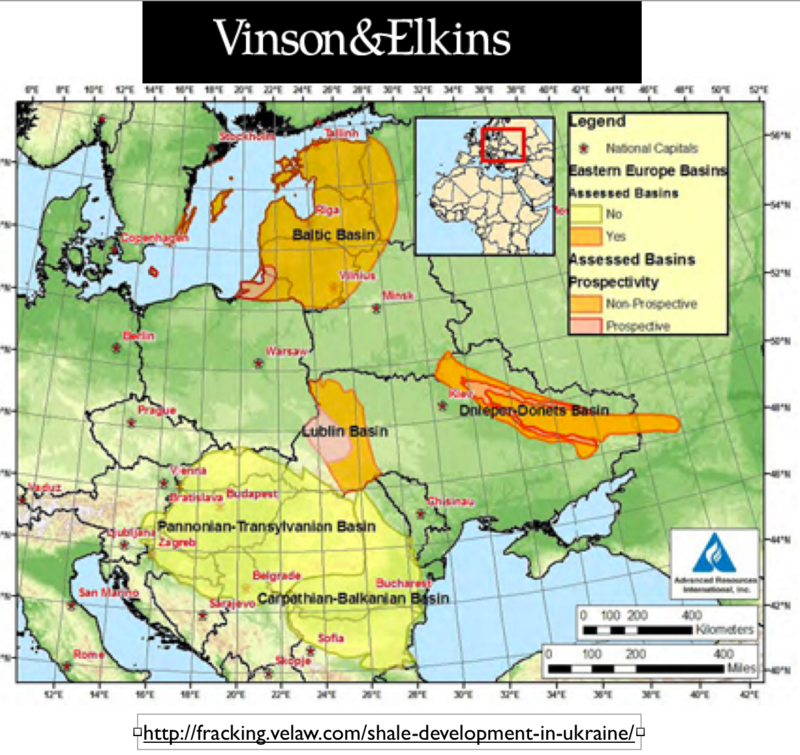 As can be seen on the map posted here, the eastern Dniper-Donets shale-gas basin extends almost to Kiev, well inside the Ukrainian core, whereas the Lublin Basin, which may hold even more gas, is located in the heartland of Ukrainian nationalism in the west. Shale gas, however, is a notoriously controversial issue. Some optimistic expectations have been dashed, as tight gas can be difficult to extract even through the most advanced fracking techniques, and initial deposit estimates have not always panned out. Public opposition, moreover, can be even more challenging. Fracking is indeed controversial, regarded by green stalwarts as an abomination, assaulting Earth through the injection of toxic chemicals deep into its veins. Eco-modernists, on the other hand, tend to grudgingly support fracking, as the natural gas that it unlocks is much less carbon-intensive than the coal that it generally supplants. Debates between the two groups often focus on technical issues, such as the amount of methane that is inadvertently released during fracking operations. In Europe, green opposition to the practice has generally prevailed. Fracking is banned in France and Bulgaria and under moratorium in Germany. Bulgaria’s decision to ban hydraulic fracturing in 2012 was particularly contentious, as it has been argued that pro-Russian forces organized the oppositional movement, fomenting protests and lobbying the Bulgarian parliament. If hydraulic fracturing were to prove as economically successful in Europe as it has in the United States, Russia’s clout in the region would be diminished. As a result, anti-Russian Bulgarian nationalists were appalled by the decision to ban the practice. Green activists, on the other hand, were thrilled. 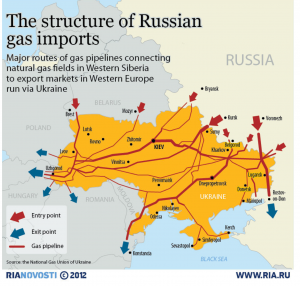 The Ukrainian crisis has again put German energy policy in the spotlight. As long as Europe’s green energy is expensive and unreliable, it favours Russian gas and leaves the continent’s energy policy unsustainable. Germany’s energiewende, the country’s move away from nuclear and fossil fuels towards renewable energies has been regarded by some commentators as an example for the rest of the world. But now Germany shows the globe how not to make green policy. It is failing the poor, while protecting neither energy security nor the climate. Lomborg is an extremely controversial figure in environmental circles. A self-styled “skeptical environmentalist,” he is regarded by most members of the green movement as a mere apologist for polluting industries. Yet some of his charges against Germany’s energiewende are difficult to deny, as the program has faltered not merely on economic but also on environmental grounds. Certainly the country’s production of solar and wind power has surged, but neither renewable source of electricity provides the baseload that must be maintained when the sun is not shining and the wind is not blowing. Due to both to a drop in natural gas use and the phasing out of nuclear reactors, Germany has had to increase its use of of coal, especially of dirty lignite, swelling its emissions of carbon dioxide. The country has also turned extensively to biomass burning, which also has distinctly negative environmental consequences. Faced with a major squeeze on consumers due to its high energy costs and burdened by its failure to meet its own environmental goals, Germany is poorly prepared to face possible Russian retaliation in the gas market. Anyone following the clean power industry today can tell you that there is something of a Moore’s Law now at work around solar power, the price of which is falling so fast that more and more homes and even utilities are finding it as cheap to install as natural gas. Wind is on a similar trajectory, as is energy efficiency. China alone is on a track to be getting 15 percent of its total electricity production by 2020 from renewables, and it’s not stopping there. It can’t or its people can’t breathe. If America and Europe were to give even just a little more policy push now to renewables to reduce Putin’s oil income, these actions could pay dividends much sooner and bigger than people realize. It is too soon to tell whether Friedman’s sunny predictions will come to pass, but they strike me as somewhat naive. Germany is giving a huge “policy push to renewables,” and thus far its dividends have been rather meager. The idea that solar and wind power are at the verge of becoming economically competitive, moreover, has been repeated now for decades; I was taught exactly the same when I was an environmental studies major at the University of California at Santa Cruz in the 1970s. It is true that substantial progress has occurred in the intervening years, but a renewable energy panacea still eludes us. The biggest problem is that of storage. Although progress is also being made on this front, battery and other storage technologies remain inadequate—and batteries themselves are extremely environmentally damaging. Considering Europe’s dependence on Russian energy and the current abundance of natural gas in the United States, many voices are now calling on the U.S. to drop its ban on exports and to begin shipping liquefied natural gas (LNG) to European markets. This proposal is strongly opposed by mainstream environmental groups, which condemn fracking and fossil fuels more generally, by American consumer organizations, which favor low domestic prices, and by the U.S. chemical industry, which also benefits from cheap gas. Some European countries, however, are keen to acquire non-Russian LNG from whatever source is possible. Currently, a major South Korean-made floating import terminal is being prepared for Lithuania. But the overall effects of lifting the U.S. export ban would probably be minimal, in large part because LNG prices are higher in East Asia than in Europe, likely making East Asia the favored export market. 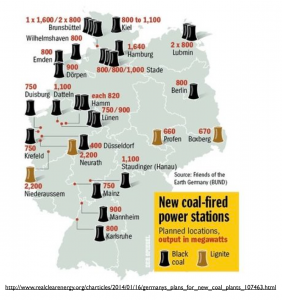 Whatever the fate of LNG exports, the problems with Germany’s energiewende, are leading to some profound re-thinking. Eco-modernists, for example, are increasingly accepting nuclear power as the best near-term option, hoping that fusion power is not too far off in the future. But to the committed greens, nuclear power remains anathema. Their challenge is to devise alternatives that are environmentally, economically, and technologically viable. A major target for reform were Ukraine’s cushy energy subsidies. The state gas company, Naftogaz, only charges consumers a quarter of the cost of importing the gas. Cheap gas discourages investment: Ukraine is one of the most energy-intensive economies in the world and domestic production has slumped by two-thirds since the 1970s. The IMF ended up freezing the deal in 2011 after Kiev failed to touch the costly subsidies. Reducing energy subsidies, however, is always a politically perilous maneuver, as it puts a new burden on consumers. Considering Ukraine’s current instability, action on this front will likely not be a high priority. Ukraine’s subsidies to Crimea, however, will almost certainly come to an end, and it will be interesting to see if Russia offers the peninsula a favorable subsidy scheme to prevent any further instability, or if Crimea will now have to pay more expensive Russian prices for its energy supply. 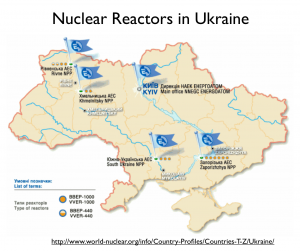 All in all, Ukraine faces a difficult energy situation in the near future.